Remember the Tamagotchi craze of the 90s, where millions of children – and admit it, adults too – were hooked on these little egg-shaped virtual pet simulation devices that required the user to take various actions to keep their pets alive? If you do, well that was really a silly little toy, because it did virtually nothing aside from showing people a little peek into what it was like to be a responsible pet owner. And if the pet died – who cares? But here’s a new spin on the idea, except that it has a much useful purpose – the Wokamon is a motion-powered virtual pet iPhone app that combines the function of a GPS pedometer with the engagement of a virtual pet, with the goal of making walking a lot more fun. Instead of button mashing, every step you take actually helps feed and nurture your little Wokamon virtual pet, so while it little pet grows up strong and healthy, you’d actually also be leading a far more active and healthier lifestyle. 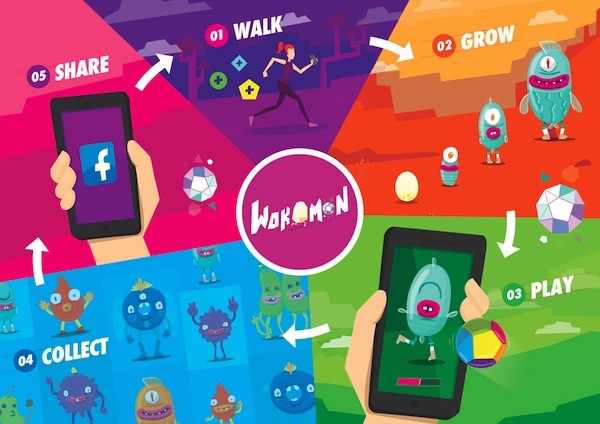 Considering the rage over wearable electronics that help track activity levels such as the Fitbit Flex or Jawbone UP, the Wokamon is an interesting mashup that actually makes quite a bit of sense for those of us more sedentary yet love to play such interactive games. It’s currently still only in prototype stage, but the developers are currently running an Indiegogo campaign to help fund the completion of the project. Do got check it out.